Okay I promise after this I will stop, I swear. 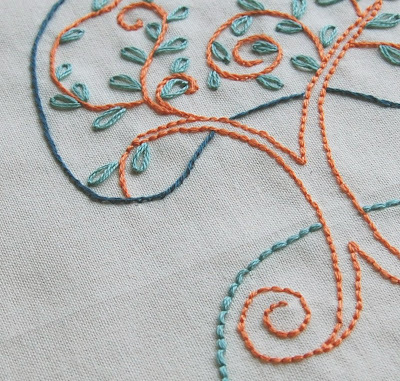 This is a tree from my latest pattern set which is comprised mostly of, well, trees. I know I need to 'branch out' into other subjects but I couldn't help myself. I just have so much fun with them. Unfortunately I broke the golden rule of Etsy, which we all know is to check your shop a thousand times a day - just kidding of course. The golden rule is to take great photos and I just couldn't get these right. They could be worse but still the color is off and I am just not thrilled with them. I am going to try to re-take them as soon as the weather and my boys cooperate but until then I have to cringe a little every time I see these shots. I don't know how long these blooms will be around but I will enjoy them while I can. I think that should be my motto for the next two weeks before school starts up again. Everyone around here is feeling that "how could Summer be ending already?" feeling. There was so much I wanted to do that didn't get done. Mostly things I wanted to do with the boys. It would probably be better if I focused on what we did do rather than all that we didn't do. Already I am sad about having to give Peter up for most of the day again. It has been so wonderful to have him around. On the other hand I have truly missed having one on one time with Adam so it will be nice to enjoy that again. Finally, I will leave you with another mystery project although I think this one is probably too easy. Any ideas what this could be? You might not like that picture, but I think that tree looks lovely! The hydrangea is beautiful indeed. The good thing is it probably will stay in bloom for a while. 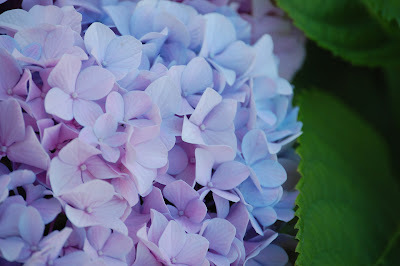 And did you know hydrangea is perfect for drying? Just put it somewhere in your house and it dries beautifully. That way you can enjoy it long after the blooming is over! 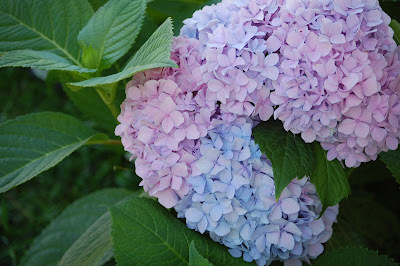 Thanks Karin, and thanks also for the tip about drying my hydrangea. I never thought about doing that but that is a brilliant idea. I am definitely going to try that. Your photos are just fine. The flowers look so real, I want to reach in and pick them for my room. I think the blue jar is rock candy in the making. Corinne, you can leave the hydrangea stems in a vase with no water, or you can tie a piece of string around the stem and hand in a warm but breeze free place. Hydrangeas don't lose much colour if left in a vase. 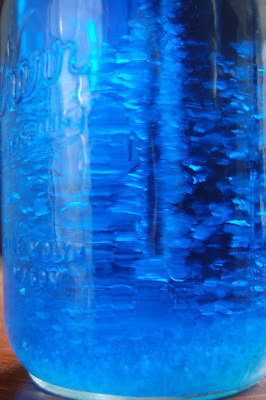 The jar looks like water coloured with blue food dye and epsom salts in the bottom. I found your website by linking from Mary Corbett's twitter. Thanks Marian, I am so excited to try this :). I should be able to take some photos today of the mystery project revealed. There are some good guesses here! Oh no, my word verification today is "failyer"! yikes :D that can't be a good sign. There is no such thing as too many tree designs, IMO. I chuckle every time I update / clean out my Wist because it's pretty obvious I have a huge love of trees and tree silhouettes ;-).